What are maguro and toro? Maguro (mah-goo-roh) or hon-maguro, is the Japanese term for bluefin tuna, perhaps the best known and most commonly eaten fish in all of sushi dining. Used in many rolls, but often seen by itself, what is now the old stand-by was not always the most popular item on the menu. While currently suffering from incredible demand, tuna was, until the 1970’s, a sport fish commonly known as “horse mackerel” and sold to companies for cat food or thrown away. Now, its fatty belly meat, known as ‘toro’ is one of the more expensive items on the menu, prized for its taste, texture, and scarcity. The name “horse mackerel” is now used for the fish called “Aji” (or jack mackerel) as, for marketing purposes, seafood purveyors didn’t want the strong flavor of mackerel associated with the much less oily and fishy tasting bluefin tuna. Tuna has come a long way from being a fish the samurai considered unclean and would not eat, to one of the most popular fish in Japan, and the world around. Tuna served in restaurants is generally one of two different species, the bluefin tuna (Thunnus thynnus), traditionally known as ‘maguro,’ which is usually fairly lean, and the yellowfin tuna (Thunnus albacares), known as ‘ahi’ (ah-hee), which is a fattier species. 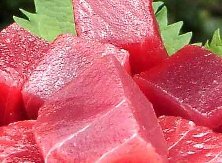 Yellowfin tuna may also be labeled ‘maguro‘ but more often than not, if you see maguro it will be bluefin tuna. Tuna sushi is further broken up into subtypes, based on the fat content. Akami (ah-kah-me) is the leaner meat from the sides of the fish. If you ask for ‘maguro’ at a restaurant, or order any kind of tuna roll or sushi without requesting ‘toro,’ you will get this cut. Chutoro (choo-toh-roh), which is sometimes labeled chu-toro, is the belly area of the tuna along the side of the fish between the akami and the otoro. It is often preferred because it is fatty but not as fatty as otoro. Otoro (oh-toh-roh), which is sometimes labeled o-toro, is the fattiest portion of the tuna, found on the very underside of the fish. This cut is fatty almost to the point of falling apart and can literally melt in your mouth. Today, approximately 80% of the world’s bluefin tuna catch is used for sushi, and the species is actually close to being threatened, and due to this, they are becoming more expensive. Toro (and especially otoro) is generally the most expensive item in the menu by weight, and in fact the fish themselves can command record prices. On January 5th, 2001 in Tokyo, a sushi grade bluefin tuna was sold for an astounding $173,600 for a 444 pound fish (which equates to $391/lb). I have personally seen people waiting on the docks ready to buy the catch of those who have spent a day deep sea fishing for tuna. This diverse fish is now one of the most popular items on the sushi menu, but hopefully its culinary success will not be its downfall. N.B. You can find sushi grade tuna at Catalina Offshore Products (among other sushi grade seafood).